The Oak Crest Bedroom Suite has a warm blend of simplicity and beauty and an air of longevity that only nature and these handpicked hardwoods can give. 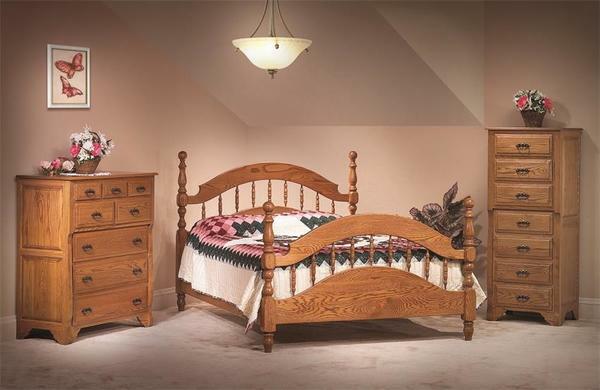 The Oak Crest Bedroom Suite is finished in 167-002 #7 (Fruitwood) - the same as the picture above. King or Queen Bed The Oak Crest King or Queen Bed is designed with aesthetics and functionality in mind. A distinct crest on the headboard and footboard and the smooth flow of spindles take this bed to the next level. Lay in the lap of luxury and dream away. Included are dovetailed mattress support slats. Dimensions: Head Board Height: 53" Foot Board Height: 41"
Lingerie Chest This large solid hardwood lingerie chest features 7 dovetailed drawers with full extension slides. Dimensions: Width: 25.5" Depth: 20.25" Height: 61.25"
Chest of Drawers: This solid hardwood chest of drawers features 8 dovetailed drawers with full extension drawer slides. Dimensions: Width: 41.5" Depth: 20.25" Height: 47.25"